"Jump to the Next Level"
Golf has its sand wedge. Now pool has the Dr Popper Jump Q! This is not your average jump cue. 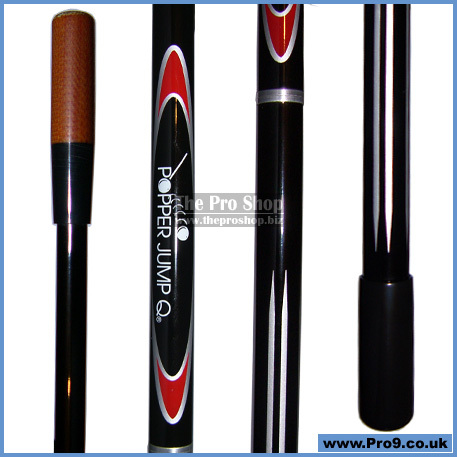 The Dr Popper Jump Q’s graphite shaft, coupled with a solid phenolic tip, allows maximum energy transfer for those shots that would otherwise be impossible with any other legal cue. The Dr Popper Jump Q allows you to jump over an object ball less then an inch away. Due to the Dr Popper’s light weight, the cue ball will travel a more vertical trajectory, getting up and down in a shorter distance. Using the dart style method, allows you to jump balls anywhere on the table.